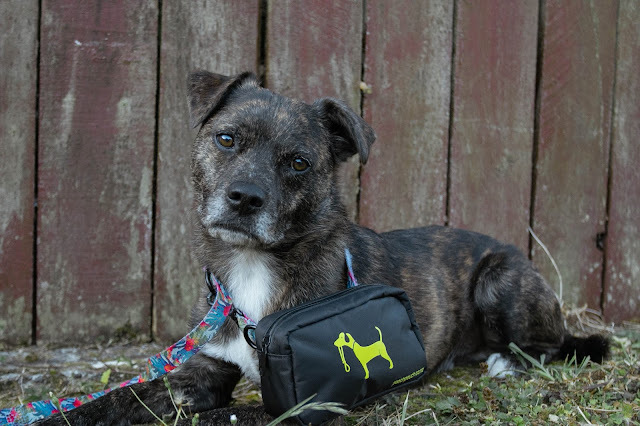 The Pooch Pouch is a versatile bag that can be attached to your leash, pants or belt to carry extra things while out walking your dog. This can be used to carry keys, poop bags, your phone, snacks, pretty much anything you may need while out and about with your dog. Before this, I would use a treat bag every time I walked Diego, and just shove my keys in there while walking. Pooch Pouch reached out at the perfect time though, because my treat bag was falling apart and was literally holding on by little threads. The Pooch Pouch connects via two domes on the back of the bag. These connections are made of strong material, the domes are tough to close and open plus they have added a bit of velcro on there to add even more protection. The way this attaches makes me feel secure that it will not fall off, or snap open for any reason. 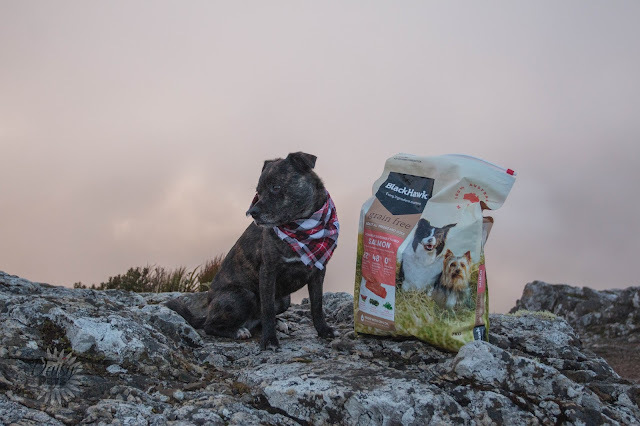 Due to how it connects, you can connect it to a lot of different places like your leash, your belt, your pants or even your dogs harness. The pouch itself is a bit big for Diego's harness, but I was talking to someone on Instagram who uses it this way and loves it. She said she is never worried about it falling off, and her pooch will hold everything inside it without even realising it is attached to them. With all that being said, the attachments are great and sturdy but they do ruin your leash. That velcro being added, means that your leash is squished between the two sides of velcro and as it slightly moves while you walk, or when you are getting things in and out of it, it rubs your leash. 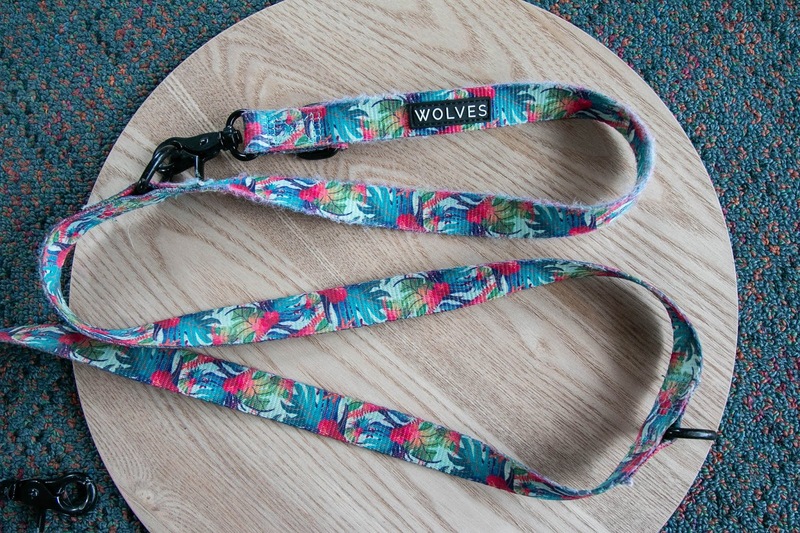 This has frayed the sides of my leash, making the leash look older, worn and a bit tacky. 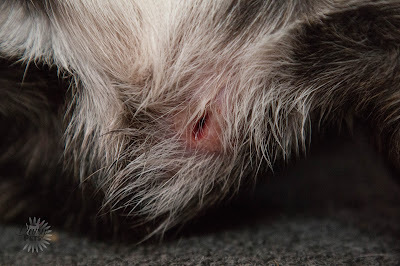 As you can see from the photo, you can clearly see where the pouches velcro has rubbed, compared to further down the leash that is not frayed at all. Personally, with the amount I spend on leashes, this is not something I want happening to my leash as it will bring it's lifetime use right down. The pouch itself is a zip closure square pouch, with a zip compartment and a another slot inside of this to separate keys, phone and cards. 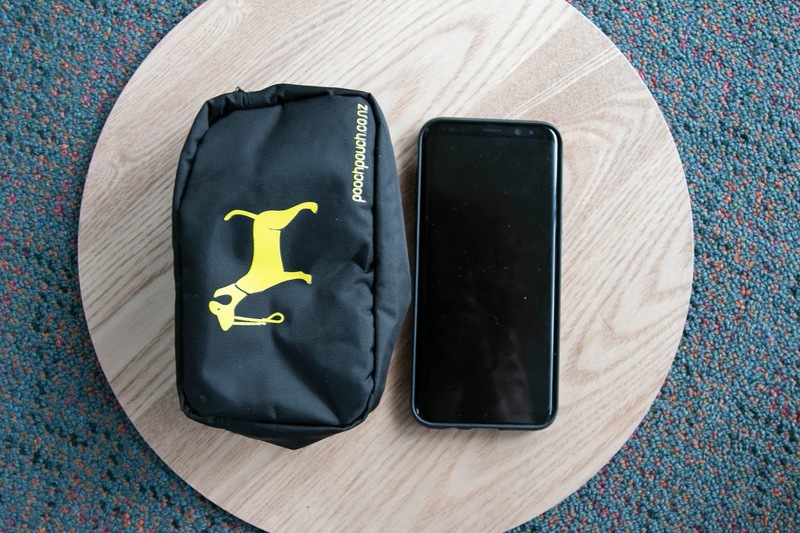 The pouch itself is spacious, can carry quite a bit and is quite big however not big enough to fit my phone as you can see by the side by side of my phone and the pouch. I do have a larger phone, my mothers fit perfectly in here, but if you do have a newer, bigger phone, be aware that it may not fit. I have been using it to hold poop bags and Diego's ChuckIt ball as this is something that we have to bring on every walk. It is easy to get the ball in and out, and the ball easily fits inside which I like. It can also fit my keys, with all the keychains I have inside with the ball which is a huge bonus. 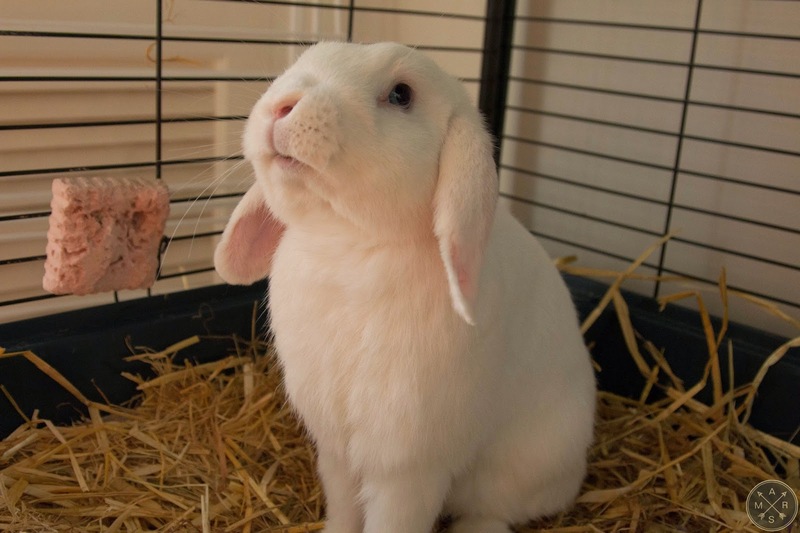 I believe you could also fit treats in as well if you are that way inclined. 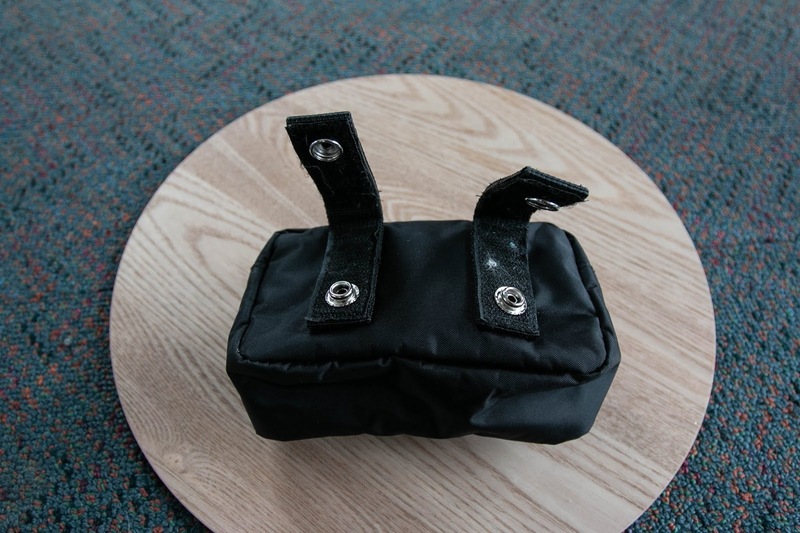 Also, if you have ever tried to take a photo inside a small, black bag you will realise why the internal photos for this product were terrible to try and get. 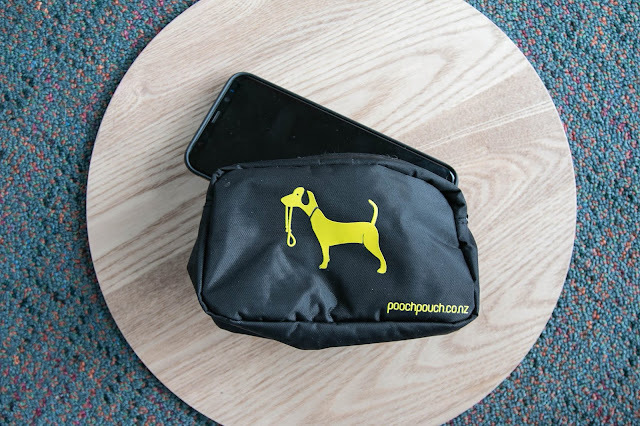 The outside of the pouch is black with the logo and website printed on it in yellow. Due to the size, shape and colours that have been used it looks like a tampon bag. 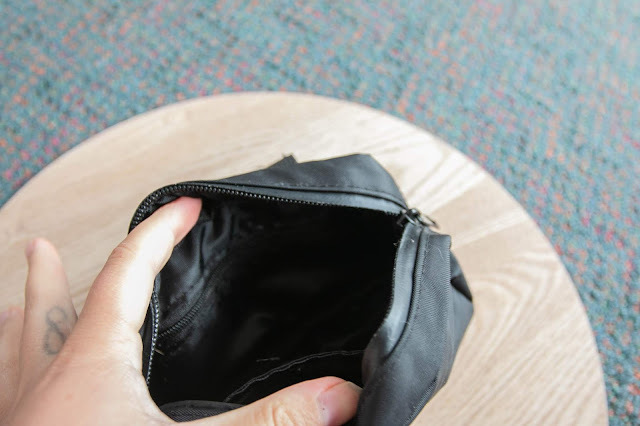 I didn't realise this myself, but I have had multiple people tell me that it is identical in shape and colour as some of those bags that you get free with your pack of tampons at the supermarket. I think this is quite funny personally but just bear in mind, people may think you are carrying around your kit on a walk haha! I think the bag could look a lot better with a pattern on it instead of straight black, or making the logo a bit smaller and less as a part of the actual design. Once again, this is just personal preference on what I like on a product. I think as you can tell from this post, I am not 100% sure on my final opinion. I think it is an amazing concept, it works well for what it was designed for which is holding things that you need while walking but there are some weird flaws that ruin it for me. The velcro attacking my leash is very off putting in my opinion because I am using leashes that cost a bit more, or that have been made to look pretty. I think maybe if you attach it to a belt, or your pants you will have less of a worry about the velcro scratching your belt. I am actually wondering whether I get some material to wrap around my waist to attach to this pouch specifically so it is more of a treat pouch instead of attaching to the leash. I think this is where I will go from here with the pouch. From there, the bag is great for holding the things I need held, I love how easy it is to get things in and out, and love the room. It would be great if it fit my phone as well, but on the same thing, I wouldn't want the pouch any bigger to actually accomodate my phone. It is versatile in the fact you can put a lot of different things in there, tampons included if you want, and that you can fit majority of treats, balls and keys in there. The price point is $21.95 which actually is quite reasonable. It sounds a lot, but when you look at the cheaper made treat bags that hook on from a terrible plastic hook, they are also in the high twenties for price. This product is definitely one I am going to keep using, and one I do quite like, it's just a shame about some of the little things that put me off. I think with the belt attachment, I will enjoy it a lot more but even then, now that my leash is frayed, I am happy to just keep using this leash with this pouch. I have been using it for every walk, and I do find it super helpful. It is also made of waterproof materials which makes it good when we adventure to the beach or rivers, and for when I shove Diego's slobbery ball inside. I think if they get more designs, or make a belt that can be purchased alongside it, I would buy it again. Let me know what your thoughts are and if you would want to try this product, or if you think it will work for you!